ABS system 40 years old - The "Ockhuisen" Mercedes-Benz Collection. 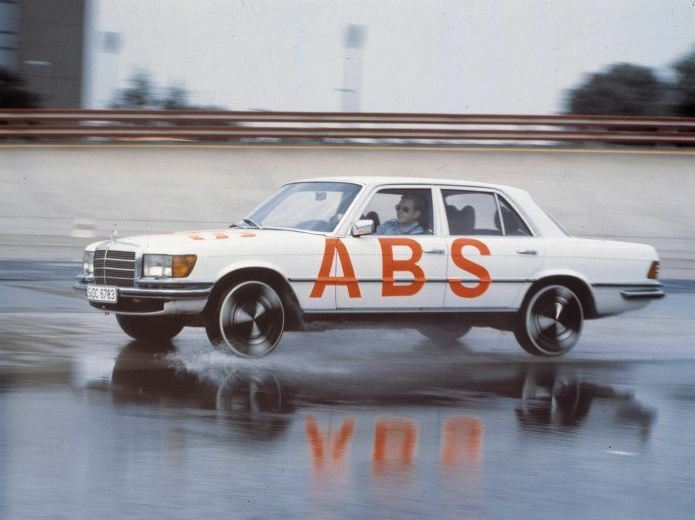 From 22 to 25 August 1978, Mercedes-Benz and Bosch presented the anti-lock braking (ABS) system in Untertürkheim. A world first, this digital driver assistance system redefined the partnership between driver and car. ABS was available in the S-Class (model series 116) from the end of 1978. Forty years ago, this development was also the starting signal for a unique story of innovation in digital assistance systems, culminating in today’s Mercedes-Benz Intelligent Drive Next Generation. Stuttgart. Maintaining full control over the car’s steering even under emergency braking, because the wheels do not lock: that is exactly what the anti-lock braking system (ABS) can do. Mercedes-Benz and its development partner Bosch unveiled the world innovation from 22 to 25 August 1978 on the test track at the Daimler-Benz plant in Untertürkheim. Another reason why ABS was such a sensation was that it ushered in the age of digital technology in the automobile. It redefined the role of the vehicle, which, in future, was to become a partner on four wheels – a partner that increasingly provided active assistance to the human behind the wheel. Jointly developed by Mercedes-Benz and Bosch and unveiled in 1978, the anti-lock braking system (ABS) was an addition to the conventional braking system, consisting in particular of speed sensors on both front wheels (1) and on the rear-axle drive pinion (4), an electronic control unit (2) and a hydraulic unit (3). Mercedes-Benz explained the principle of the anti-lock braking system like this in a brochure forty years ago: “The anti-lock braking system uses a computer to monitor the change in rotational speed of each wheel during braking. If the speed slows too quickly (such as when braking on a slippery surface) and the wheel risks locking, the computer automatically reduces the brake pressure. The wheel accelerates again and the brake pressure is increased again, thereby braking the wheel. This process is repeated several times in a matter of seconds”. What might have sounded complicated in an age of analogue electrics and electronics was simply convincing in practice: even in wet, icy, snowy or challenging conditions, ABS enabled the automobile to deliver the maximum physically possible braking force, without the wheels locking, while the vehicle remained steerable even under emergency braking. Mercedes-Benz S-Class saloons (model series 116) at the test track in Stuttgart-Untertürkheim, 1978. The upper vehicle with anti-lock braking system (ABS) remains steerable, while the lower vehicle without ABS continues to slide uncontrollably, despite the front wheels being at full lock. 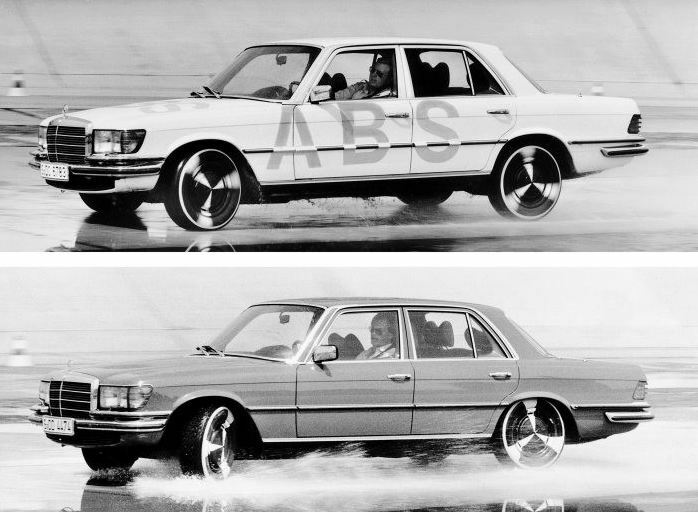 Following its premiere 40 years ago, it was only a small step before the anti-lock braking system entered series production: ABS made its debut as an optional extra in the Mercedes-Benz S-Class (model series 116) in late 1978. At that time, it cost an extra DM 2,217.60. Two years later, it was optionally available in every passenger car manufactured by the Stuttgart brand. In 1981, Mercedes-Benz introduced the anti-lock braking system for commercial vehicles. And from October 1992, ABS was to be installed as standard in all passenger cars from the brand with the star. Today, this assistance system in cars is a matter of course for virtually every manufacturer worldwide – thanks to the innovation culture at Mercedes-Benz. The premiere of the anti-lock braking system 40 years ago was a magical moment in the unique innovation history of digital assistance systems from Mercedes-Benz. Yet the history of ABS at Mercedes-Benz dates back to the 1950s. In 1953, Hans Scherenberg, then head of design at Mercedes-Benz, applied for a patent on a system to stop a vehicle’s wheels locking under braking. Although similar solutions already existed in aviation (anti-skid) and on the railways (Knorr anti-slip protection), the automobile was a highly complex system with especially high demands on sensors, signal processing and control. For example, the components needed to register the rotational deceleration and acceleration of the wheels without error, including when cornering, on irregular surfaces and in very dirty conditions. ABS testing at the Stuttgart-Untertürkheim plant of Daimler-Benz AG. Comparison of the braking performance of S-Class saloons (model series 116) with (right) and without anti-lock braking system on a wet road surface. 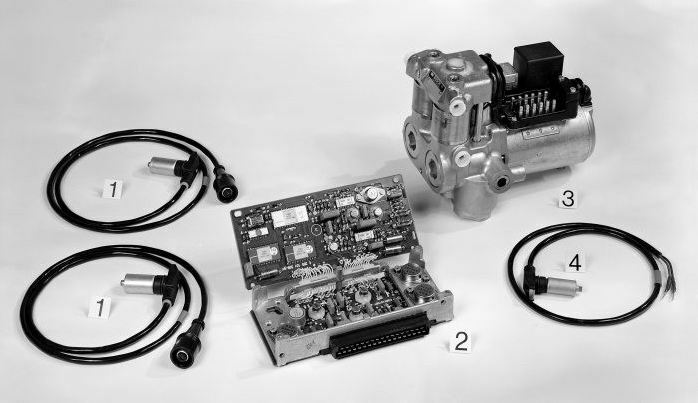 An intensive, continuous exchange of knowledge between the Group’ s own Research & Development and industrial partners ultimately led to success, with 1963 seeing the start of concrete work on an electronic-hydraulic brake control system in the Advance Development department of what was then Daimler-Benz AG. In 1966, the company began collaborating with the Heidelberg electronics specialist Teldix, which was later taken over by Bosch. The result premiered in 1970, when Hans Scherenberg, now head of development at Daimler-Benz, presented the analogue-electronic “ Mercedes-Benz/Teldix Anti-Bloc System” to the media at the test track in Untertürkheim. The launch in 1970 delivered the proof that the system worked. Yet the developers realised that a digital controller was the right approach for a mass-produced ABS – more reliable, less complex while also much more powerful than analogue electronics. Together with Bosch, which was responsible for the digital control unit, this led to the digital, second-generation ABS. Engineer Jürgen Paul, head of the ABS project at Mercedes-Benz, later described the decision in favour of digital microelectronics as the breakthrough moment in the development of ABS. The all-embracing victory march of digital assistance systems in Mercedes-Benz automobiles began with the anti-lock braking system. ABS sensors, among other components, were used also by new systems such as Acceleration Skid Control (1985), Electronic Stability Program ESP® (1995), Brake Assist System BAS (1996) and adaptive cruise control DISTRONIC (1998). Added to these were increasingly powerful sensors, such as the yaw rate sensor of ESP®, the radar of DISTRONIC as well as, at a later date, camera systems, ultrasound and GPS. ABS testing at the Stuttgart-Untertürkheim plant of Daimler-Benz AG with an S-Class saloon (model series 116). Under braking when cornering, the anti-lock braking system maintains driving stability and steerability, provided the physically possible cornering speed has not already been exceeded. Ever since 1978, Mercedes-Benz has regularly set the benchmark for the entire industry with individual digital driver assistance systems. The same applies to the intelligent linking of the systems to produce higher-level solutions. What began as an integrated approach to safety at the turn of the millennium continued with the preventive safety system PRE-SAFE® through to today’s Intelligent Drive Next Level. 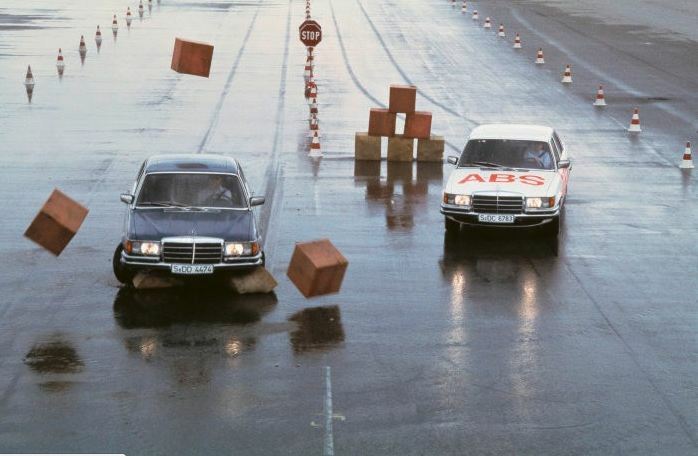 Never has the automobile been as intelligent as it is today – thanks to a history of innovation at Mercedes-Benz that began 40 years ago with the premiere of the digital anti-lock braking system.